Manchester City Council are a member of CLES and the two organisations have a long track record of working together for the benefit of the local economy, the citizens of Manchester and wider GM economy. This nomination focuses on the work which commenced in 2007/8 which was initially to gain a better understanding of the impacts of the Council’s £357m procurement spend with its top 300 suppliers and followed implementation of the Council’s sustainable procurement policy. The organisations have worked closely together to improve on the initial baseline results and bring together a range of stakeholders and suppliers for a common aim. The work has been ground breaking and has developed year on year with new recommendations emerging from every subsequent annual survey that have pushed progressive procurement to the next level. The impacts are measurable and the challenges that CLES have brought to the Council coupled with the Council’s desire and drive to maximise the impacts of its procurement spend have attracted attention from across the country and beyond, including a visit to Manchester by a delegation from the Chinese government who had heard about the work to use procurement as an enabler for the local economy. Why do you think it should win this award? I think CLES should win this award for the expertise, energy, influence and innovation they have brought to the Social Value agenda and within the ten year period the partnership has extended in a truly collaborative sense to connect the Chamber of Commerce, suppliers, local authorities and politicians; creating networks that didn’t previously exist including the Social Value Network. Their promotion of the work through events, publications, articles and workshops has raised the profile of the power of procurement as an enabler for the local economy. Case studies have been collected along the way that show the real impacts of the work including how employment practices since the “CLES/MCC conversation” have been adopted by organisations to the benefit local people. The work was recognised in 2014 when the Council won a central government “Best Councils to do Business With” award presented to the City Treasurer and Head of Procurement in Westminster for the Council’s work with SME’s. 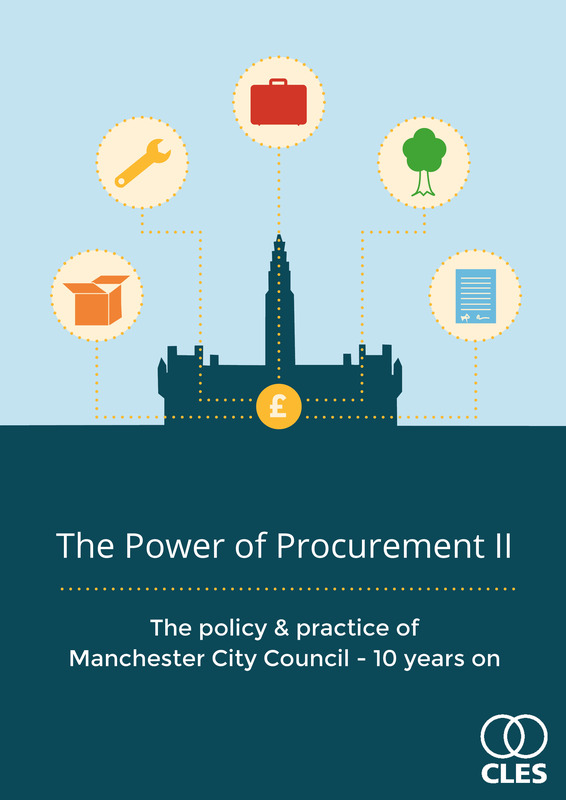 CLES have recently published “The Power of Procurement II” which reflects of ten years of partnership working with the Council and this was launched at a major event at Manchester Town Hall to the extended network detailed earlier in this nomination.